Polite and well balanced preserves the unique and unmistakable profile of Lugana associated with freshness and greater organoleptic complexity resulting from its sparkling careful. Produced with classic method sparkling wine with minimum of 15 months. It ‘s definitely the champagne most characteristic and typical of the area of Lake Garda. 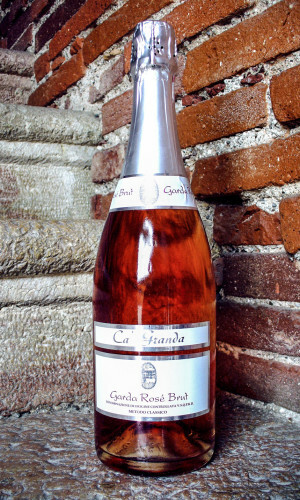 The sparkling base is obtained from a mixture of red grapes del Garda. These grapes are vinified with short maceration on the skins. You get a nice pink wine with a strong acid in order to better support the spumantizzazione.Questo sparkling wine is different from all the sparkling rosé. Surprise its scents of flowers and berries. Acidity discreet with a great freshness of taste sensations with an exceptional property.